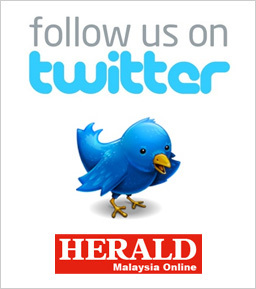 Hudud delay a way out for PAS and Umno? PAS’s decision to shelve its proposed Islamic criminal law, or hudud, is to all intents and purposes a way out of a political quagmire for the Islamist party and rival Umno, both of whom have been caught in a maelstrom of protests from their non-Muslim allies, say politicians and analysts. “Football is a social entity, and requires social responsibility on the part of players, both on and off the pitch, and by national and local managers” Pope Francis said on Friday morning (May 2). The World Day for Safety and Health at Work was celebrated on April 28, 2014. Pope Francis continues to drop hints about the possibilities of “development” in the Catholic Church’s treatment of divorce. He is reported to have telephoned an Argentine divorcee who had written to him after being told she could not receive Holy Communion: he assured her, she said afterwards, that she could. Equality, liberty and human rights are “godless” and “faithless” ideologies created by atheists to destroy Islam! This is the opinion of the Islamic group Ikatan Muslimin Malaysia (ISMA). Prime Minister Najib Razak has done little to redress the growing divisions and social inequalities between communities within Malaysia. Our generation has witnessed a religious revolution so extraordinary that it is sometimes hard to appreciate. IIf there was one voice that dared rattle the ruling government of Barisan Nasional, it was that of DAP’s Karpal Singh. His no-nonsense reaction to the BN leadership’s machiavellian ways of staying in power scared the wits out of the ruling government. The canonization of Popes John XXIII and John Paul II takes place today, April 27, at St Peter’s Basilica. Both of them are “bound together” by their love for addressing the world issues that affect many people. For years work has been underway to revise the Japanese Missal, but the task of updating the 1978 edition has proven to be a thorny problem.